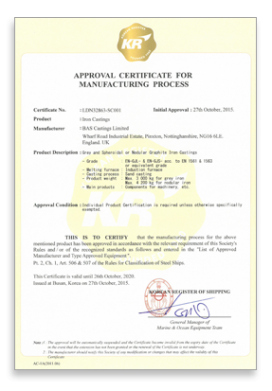 We are pleased to announce the approval certificate for the manufacturing process of Grey and Spheroidal or Nodular Iron Castings by the Korean Register of Shipping. We are delighted to have achieved this accreditation. This further reflects are strengths in sectors that require third party inspection and exceptionally tight quality controls through all aspects of our business. After 30 years of service our Works Manager Mr Ray Price is retiring from the business. Ray has played an important part in the company’s development in this time and will be missed. The Directors and staff wish Ray all the very best for his retirement. We are delighted to announce that Nigel Cooper has been appointed to the board of BAS Castings Ltd as Operations Director with overall site activity responsibilities. Nigel has been with now for 6 months and has made an immediate impact by introducing a new systems and methodology that are resulting in increased efficiency & lower manufacturing costs. The changes he has introduced are derived from the desire to build on the company's excellent reputation as being the leading UK supplier of Iron Castings and achieve the very highest levels of "right first time" and "on time deliveries" to our valued customer base. Good communication with the client is also a high priority in the fast paced environment we and our clients work in. We are delighted to announce the arrival of Nigel Cooper who has accepted the very senior position of Operations Manager. Nigel brings with him a wealth of experience. He is very much focused on improving all aspects of the production activities within the business with the introduction of modern manufacturing techniques. Our ultimate aim is to ensure the very best customer experience for our valued clients. In order to further our manufacturing range we have recently installed a new state of the art 1 tonne Inductotherm Medium Frequency Electric Furnace. In undertaking this significant capital expenditure this demonstrates our commitment to the long term future of our business. Stuart brings in depth sales experience, energy, enthusiasm and a very professional approach to customers and communication. He will be responsible for identifying new market sector opportunities and at the same time develop new projects with our existing partners. BAS Castings Ltd has ambitious development targets and his contribution will help fuel the growth that we are seeking in 2014. We are pleased to announce that following a successful full day audit by TUV we have received a renewal of our existing accreditation. Our new certificate runs for three years and covers casting production up to 5 tonne casting weight. A full process audit along with a site tour to look at various key operations took place as part of the granting of the new accreditation. BAS Castings are pleased to announce that the company has recently completed a 2 year project to change the Environmental status of the business from a traditional SME foundry classed as a Part B processes to a more tightly monitored and controlled Part A2 process. This is a major development for our business. The change to our status is required to supports our current high customer demand and ambitious 5 year expansion programme. BAS castings have obtained an Environmental Permit from Bolsover District Council under the Environmental Permitting Regulations 2010 to enable the company to produce 20 tonnes per day or more of finished castings. The previous (part B permit) was concerned only with emissions to air but the (A2) permit now in place requires an integrated management approach to all environmental impacts. This provides additional benefits to the environment, and all stakeholders. To achieve this, the company has committed significant capital and personnel resource in order to carry out the detailed assessments of its emissions to air, land, and water and implement the measures necessary to minimise these to levels that are well within UK regulations. Regular assessments and measurements by independent organisations are made on an ongoing basis to ensure that this high standard of performance is maintained. An Environmental Management System is in place to ensure that the measures are in place to meet current and future legislative requirements.